Offering custom and private Umbria tours with expert tour guides. All the private tours in Umbria are custom tours that include your choice travel dates, destinations and activities – truffle hunt, wine tasting tours, cheese tasting, cooking class. For a list of some of the private tours in Umbria we offer, click on the menu above called Private Tours & Day Trips. Our Umbria tours may take you to Assisi, Perugia, Spoleto, Gubbio. Our day tours to Umbria can include any of the following destinations: Deruta, Gubbio, Montefalco, Spello, Todi and more. Escorted group tours that include Umbria are also available. Every inch of Umbria is ancient. The landscape of rolling hills and meandering country roads has been perfected over three millennia. Known as ‘the green heart of Italy’, it’s the only region that borders neither the sea nor another country. Umbria has retained many of Italy’s old-world traditions. You’ll see grandmothers in aprons making pasta by hand and front doors that haven’t been locked in a century. In spring the countryside is splashed with red, pink, yellow, purple and blue wildflowers. 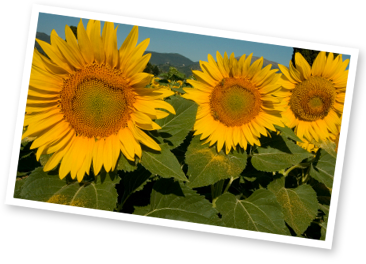 In summer it explodes with the vibrant yellow of the sunflowers harvested to make cooking oil. The rolling mountains of the Apennines in the north and east descend into hills, many capped by medieval towns, and eventually flatten out into lush valleys along the river Tiber. An Umbrian adventure can span from nightlife in the region’s student-filled capital, Perugia, alive with its famous Università per Stranieri (University for Foreigners), to a peaceful stroll through 2700-year-old rural villages. Assisi is one of Umbria’s most magnificent hill towns, with buildings that glow pink in the sunset. To boot, it also happens to be the home town of St Francis who, not surprisingly, preached about the beauty of the natural world. He wandered through towns like Gubbio, a stately medieval stronghold, and Todi, once called ‘the most liveable city in the world’. In the southeast, Spoleto attracts art patrons to an international festival that has put the charming city on the map year-round, and in the southwest, Orvieto’s cathedral wows millions of visitors. Vacationing foodies will delight in Umbrian food and wine. The earthy, addictive tartufo (truffle) finds its way onto every menu, gracing the local strangozzi or umbricelli pastas. Pork from the Norcia area is so well respected, quality pork butchers throughout Italy are known as Norcineria. Orvieto’s golden wines and the Sagrantino of Montefalco have made their way onto tables around the world.